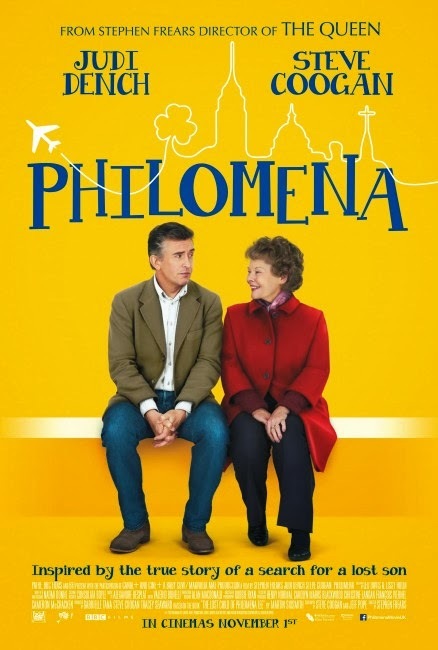 This sentimental movie led by a quietly dignified Judi Dench and penned by co-star Steve Coogan is quintessentially British in nature: dry humour, emotional but not gut-wrenching, and so very proper throughout. It tugs at the heart strings but does not emotionally manipulate like most Hollywood fare. Stephen Frears adopted a rather documentary-style approach to the story which, for better or worse, puts the audience firmly in their seats and never really part of the events. This style was useful in the flashback scenes. Visually Frears gave the past and present two distinct looks, with the past appearing more grainy like a faded film (memory), but as we join Dench and Coogan in the present, there is some disconnect between us and them as he continues with the documentary-style presentation. If it was not for Dench's quietly powerful and intimately heartfelt portrayal, a lot of the film's moments would not have struck the emotional chord of the audience. Her eyes and her subtle expressions adds layers and dimensions to the simple old, Irish lady that she appeared to be. The fear, the rage, the despair, the joy and the relief that might have gone through Philomena's mind were all palpable to us through Dench. If not for Cate Blanchett, Dench might have a chance for the Oscar (against Amy Adams). Steve Coogan the actor was par per excellence opposite the indomitable Dench. But he was not really given much to do other than being pompous, arrogant and indignant. Although he did do all that with aplomb. However, as one of the film's writer - together with John Pope - Coogan may have overdid on some of the quippisms. Too much humour was drawn out of the old country lady in the new modern city schtick. There were also some scenes that were purely extraneous and could have been better integrated although that is as much Frears' fault. Coogan and Pope's screenplay may also have needed a bit more characterisation on Dench's Philomena to justify the ending. Tough fight for them against 12 Years A Slave for Best Adapted Screenplay. Michelle Fairley aka Catelyn Stark was on too briefly, but - boy! - did she look fierce or what? Alexandre Desplat gave us a wonderful score. He has been missed this awards season. His music was hopeful and alive, but yet never overtly dramatic to drown out Dench. Reminds me of his work on The Golden Compass. Pity I do not think this is his best work and so I doubt he will bring home the Oscar this year.